"Endgame" Cardassian Rifle for sale. A modified two-handed prop Cardassian rifle weapon made from solid cast resin with additional metal and resin parts -- 22in. long -- This Cardassian weapon was used in the Voyager series finale "Endgame, Part 1". It was the Cardassian rifle that Korath (Vaughn Armstrong) modifies to fire a Nadion pulse. You can see the archived auction here. And read more on the Star Trek Prop, Costume & Auction Forum here. It is a beautiful piece, and I highly recommend it. Star Trek items still left at IAW? Martin Netter emailed me and said that there are still Star Trek items left. Martin refuses to tell me what he bought and what is left. He cannot therefore confirm that anything is left. All evidence indicates that all the Star Trek items are gone. Why let go the staff at the warehouse if there were items left? Why the rush to settle up accounts with everyone? Many have heard from IAW by phone, which never used to happen when WE needed customer support! If I were to bet, I would say that IAW is done with Star Trek. Martin has already noted on the Star Trek Forum that he is willing to sell items to collectors and he has reached out to a few collectors which is very nice of him. He indicated that whatever he doesn't need for his museum he will put on sale. I do hope his museum comes through as it should be like another Star Trek Tour. Martin Netter, who many of you know as filmwelt-Berlin on eBay, has confirmed on the Star Trek Prop Forum that he did in fact buy out the remainder of the Star Trek items from IAW. Martin also stated he is working hard on his Sci Fi museum, which will be near the Hanover, Germany airport. Good luck to Martin, and now we can finally bid IAW good riddance! 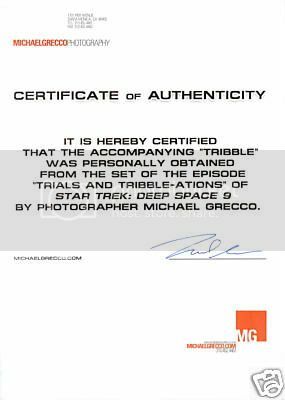 There are currently six Screen Used Tribbles on eBay being auctioned off by Michael Grecco, a photographer who photographed the cast of DS9 for an Entertainment Weekly Story in 1996. Part of the proceeds go to support www.trekcore.com, which is a must for any Star Trek prop or costume fan. I HIGHLY recommend you bid on these if you want a great piece of Star Trek history! 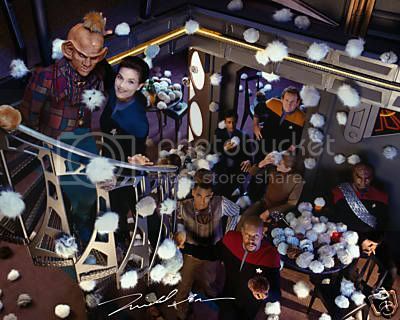 Michael Grecco photographed the cast of Deep Space Nine in 1996 (see included photograph) for Entertainment Weekly, for a story on the “Trials and Tribble-actions” episode. 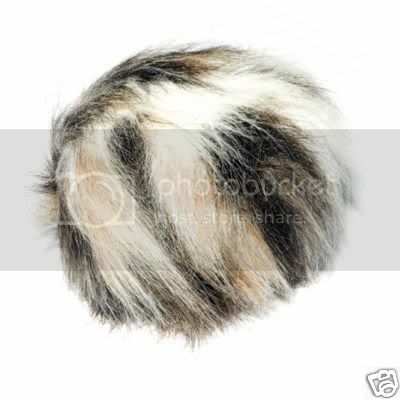 It was during this shoot that Michael acquired this Tribble, that is up for auction today. Well, I believe that the IAW sale of the remaining Star Trek assets to Martin Netter is a done deal. Dom emailed me yesterday and when I asked him to confirm, he didn't email me back. Of course that is business as usual for Dom, but Martin also saw the blog post and didn't deny it on the Star Trek Prop Forum. I am 99% sure this is the case. What will Martin do with everything? Well, he just stores everything now in a warehouse where his cats run loose among the items. He talks of an exhibition of his Star Trek items, and I hope this is the case. But the failure of the Star Trek Tour, makes such a prospect unlikely I think. I do wish him the best of luck though and hope we get to see everything! Martin Netter buys out IAW Star Trek Inventory ? Well, based on piecing together some information from various sources, it appears that Martin Netter (filmweltberlin on eBay) has purchased the rest of the Star Trek stock from IAW and there will be no more auctions. I cannot be sure of this, but a few items make this the likely scenario for IAW firing their warehouse staff. 1) Martin Netter was in LA last week. 2) Martin has bought large amounts from IAW before. 3) Martin backed out of a deal to buy the Raptor from BSG. 4) Martin told Universal he was in LA to buy a big collection. 5) IAW fired everyone in the warehouse who worked on Star Trek, which they would not do if they were going to continue the sales on eBay. When I have confirmation of this, I will let you know more. It appears that most of the IAW warehouse staff has been let go. I have confirmed that both Colin Warde, the guy we all turned to when we had an issue, and Gil Maldonado, the shipping manager, have been let go. In fact, word is that IAW has fired ALL the staff that worked on the Star Trek project. In addition, IAW has taken down almost all of the week 116 auctions. Only 3 are left. I have have contacted Tiara to confirm that this does not affect those of us who have thousands of dollars in product waiting to be shipped. I got her voice mail and left a message. I will post again when I hear back from her. I have asked simply to give some reassurance that everything will be shipped that is owed. I spoke with David from IAW on the phone and he said that there is NO issue around getting your items. Yes, they are undergoing a reorg. They have two new projects that they need to make space for (maybe a bigger warehouse David said) but while there may be a slight delay with Star Trek items being shipped, they WILL be shipped and everything is fine. Star Trek Prop Blog wins Ex Astra Scientia Award! Well, I am quite honored that Ex Astra Scientia, one of the top Star Trek web sites on the web, gave the Star Trek Prop, Costume & Auction Blog its EAE Award this week! SCI FI Wire confirmed today that a contract has been signed with CBS/Paramount to reopen the Star Trek The Experience exhibit in Las Vegas on May 8 —starting with at least a new restaurant and retail shop—to coincide with the opening of J.J. Abram's Star Trek movie. "It is a bit premature to talk about it, but I can confirm that a contract has been signed," Liz Kalodner, executive vice president and general manager of CBS consumer products in New York, told SCI FI Wire exclusively. "I do not have any further comment." Las Vegas city public information officer Jace Radke confirmed to SCI FI Wire that Star Trek The Experience, which was to be closed at its home at the Las Vegas Hilton this year, will move downtown to the Neonopolis Center. "This is going to be a major part of the downtown redevelopment we have been working on, and the city department of business development has been trying to encourage attractions like this to the area," he said. The Experience featured a restaurant and bar, shops and motion-simulator rides themed to Star Trek: The Next Generation ("Klingon Encounter") and Star Trek: Voyager ("Borg Invasion 4-D"). It's expected the new exhibit would feature similar rides at some point. For now, however, the plans envision just a new version of Quark's Restaurant and Bar, a Museum of the Future (perhaps incorporating elements and characters from the new movie) and a shop. For his part, Las Vegas mayor Oscar Goodman said, "We are very excited about this for downtown." The move would be part of the city's effort to redevelop the older part of downtown Las Vegas—situated at the end of the Strip of large casinos—into a more vibrant tourist and residential area. The Neonopolis project is one of the centerpieces of the area. Radke added, "We are trying to secure other projects as well, but this Star Trek exhibit is happening, and we hope to have a portion of it ready by May 8. We're working on getting the Ts crossed and the Is dotted in the contract." Journalist Mark Hansel, who writes for In Business Las Vegas, has seen the contracts signed by studio officials, Neonopolis owners and the city of Las Vegas. "I have seen the contract, and I know that the city redevelopment manager met with CBS officials in New York to seal the deal," said Hansel, who has covered the downtown redevelopment for years for In Business and the Las Vegas Sun. "They are hoping that there will be some sort of premiere event at the time of the movie opening that will be out here. Obviously, the big premiere will be in Hollywood, but they hope to have something out here, too." The costumes, the historic timeline, models of the ships and other items at the Star Trek The Experience exhibit will be moved to a museum that is planned for the new location, but much of the exhibit probably won't be opened until the end of 2010. "I wouldn't expect the cool stuff for about a year," Hansel said. "A lot of it also depends on the popularity of the movie and how well it does, but the trailer looks like it's going to be pretty great." He added: "The price is going to be cheaper, maybe $20 or $25, and there may be package deals or year-long memberships, that kind of thing." Hansel said interest in the exhibit has waned in recent years. "I talked to people in the town about it, and they just weren't going or interested, but now there's a new buzz, especially since this is going back to the early years of the series," he added. The new venue already has a 3-D-enabled movie theater, and there may be plans to have a 4-D "experiential" ride similar to the ones at the Hilton. Neonopolis manager Rohit Joshi projected that 7 million visitors could come to the exhibit a year, which Hansel said is "a reasonable estimate."